Brilliantly uniting the personal and the critical, French Lessons is a powerful autobiographical experiment. It tells the story of an American woman escaping into the French language and of a scholar and teacher coming to grips with her history of learning. Kaplan begins with a distinctly American quest for an imaginary France of the intelligence. But soon her infatuation with all things French comes up against the dark, unimagined recesses of French political and cultural life. When, as a graduate student, her passion for French culture turned to the elegance and sophistication of its intellectual life, she found herself drawn to the language and style of the novelist Louis-Ferdinand Celine. At the same time she was repulsed by his anti-Semitism. At Yale in the late 70s, during the heyday of deconstruction she chose to transgress its apolitical purity and work on a subject "that made history impossible to ignore:" French fascist intellectuals. Kaplan's discussion of the "de Man affair" — the discovery that her brilliant and charismatic Yale professor had written compromising articles for the pro-Nazi Belgian press—and her personal account of the paradoxes of deconstruction are among the most compelling available on this subject. French Lessons belongs in the company of Sartre's Words and the memoirs of Nathalie Sarraute, Annie Ernaux, and Eva Hoffman. No book so engrossingly conveys both the excitement of learning and the moral dilemmas of the intellectual life. "Alice Kaplan beautifully describes the intricate mixture of lust and embarrassment and voyeurism and submission and pride involved in immersing oneself in another language. . . . This girl’s own story---of a daughter, a spy in the house of French, a teacher and scholar-is imbued with a sense of the multiplicity of identity, and it gracefully tells us what Kaplan says French has taught her: ’There is more than one way to speak.’ "
"An uncommonly forthright and concise piece of autobiography. Kaplan has shown that university professors, too, can have a past worth telling, that the subjects they teach may mean far more to them than any student could begin to guess." "This original, artful, engaging book belongs to an evolving genre of postmodern intellectual autobiography. Telling her story about a girl from the midwest who learned to speak perfect French, a student of deconstruction who became intrigued by fascism, Alice Kaplan writes insightfully also about language, memory, politics, and writing. Kaplan’s father was a lawyer at the Nuremberg trials who died when she was only seven: she recalls the frightening photographs of concentration camp victims she found among his papers. The glamour of otherness and the allure of evil-as well as the characters of various mentors, meals, lovers, and students- are the subjects of this witty and insightful memoir." "Born a Jewish daughter of the American Midwest, Alice Kaplan became a professor of French and an expert on the literature of French fascism. 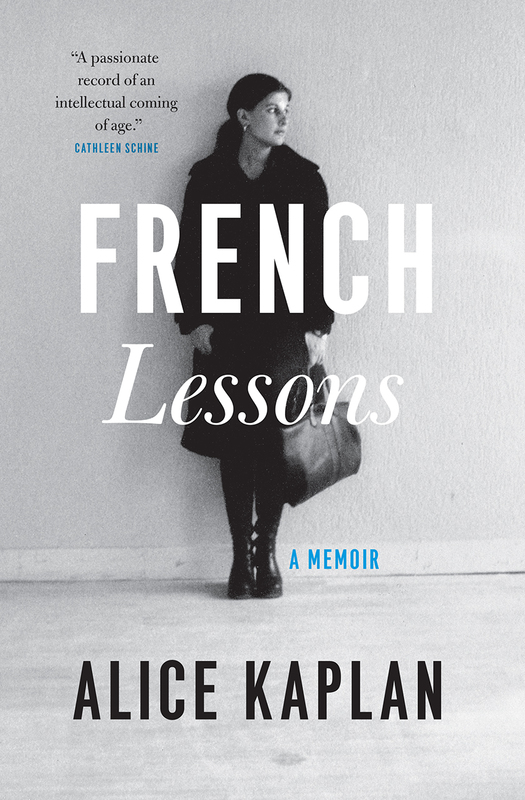 French Lessons is the story of her cultural odyssey, a brave attempt to articulate the compulsions that drove her to embrace foreignness in order to become truly herself. . . . Told in a ’staccato Midwestern style,’ her story of becoming French is arrestingly all-American." "Alice Kaplan has written a wonderful book, as accessible as light fiction and as polished and layered as poetry. . . . The precision and intensity of Kaplan’s presentation of self in everyday life makes for an extraordinary literary achievement." "A lovely book. . . . From the childhood learning of words from her siblings, to her professorship at Duke, she has catalogued her desire to speak a foreign language and thereby to become something foreign and alluring herself." "French Lessons captures the excitement Kaplan experienced as she fell into the French language: mastering the difficulties of French pronunciation, the forms of the French verb, the forms of French politeness." "This is the most engaging new bildungsroman I have read in years-and especially because the bildung in question, the learning of French by a young American woman, brings with it such an amazing range of personal drama of modern and contemporary political and cultural history."